Yasunori Mitsuda’s contributions to this album are great in number, and though some are short and unimpressive, he offers a couple of nicely crafted laid-back pieces. The first track on the album “Luminous Rain,” for example, is a melancholy and reverberant piano and strings piece. It provides a nice introduction to both the game and album. Similarly, the laid-back tones exhibited by the woodwind and swaying strings in “The Northernmost of the Empire, Topazion” are just as enjoyable, especially when coupled with its subtle, captivating development. “Snowdrops Blooming, Opalus” also takes upon a similar style to this, and is actually one of Mitsuda’s most captivating themes on the album. Really, it’s a combination of Mitsuda’s ability to create a gorgeous piano melody, graced with his expertise in constructing an airy atmosphere with strings and woodwind. His most striking relaxing track though is “Lacarde Sywalk.” Of course, the theme features a graceful piano part and stings, and it’s actually the string undertones and melodic lines that give the piece some substance. 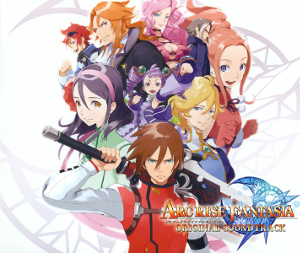 Alongside these themes, Mitsuda also contributes a number of vocal themes to the album, with the help from vocalists Emiri Kato and Yui Makino. Mostly though they are either short (e.g. “Light of Purification,” “Song of Ruin” and “Heaven’s Tears”) or disappointing. “Imaginal Song,” for instance, is a short underdeveloped piano piece featuring vocals in the style of Eri Kawai, but without the magic of her voice. Alongside this is “Real Song,” which carries a haunting atmosphere, but really fails to grip the listener with its weak musical core. A piece which is more interesting and perhaps better directed is “Sacred Hymn.” The piece is hymnal in essence, and features a baroque-styled organ movement in the background, further adding authenticity to the piece. Overall, Mitsuda’s vocal contributions are fairly weak this time round, and so are the rest of the vocal additions on the album. Take Yui Makino’s “Angel Stairs ~crepuscular rays~” as an example: the background to the track arranged by Tsuneyoshi Saito is stunning, but the vocals are completely unexpressive. Mitsuda is redeemed with his grand, militaristic, and darker contributions. A great example of a successful grand track is “The Imperial City of Diamant,” similar to his town themes on Inazuma Eleven and Soma Bringer. There are some common motifs, such as the string accompaniment, but mostly it succeeds with its beautifully constructed melody, captivating strings, and thrilling woodwind before leading into a stunning section just before the loop. It works beautifully in the expansive city in the game too. Mitsuda’s darker themes are just as impressive. The Xenogears-esque “Meridian 2nd Hikoutei Squad” is a dark, brooding orchestral theme featuring choral and woodwind accents. “Contaminant Dragons” is a bit shorter, and also carries with it a dramatic flair via the use of orchestra and choir. It also manages to throw in a very haunting section as well. “Great Existence” is another orchestral piece that incorporates some frenetic strings, some interesting industrial beats, and mystical vocal work. The mysterious “Chance Meeting with the Rogress” is a certain favourite too, with its simplistic harp arpeggio accompaniment and airy woodwind motifs. This creates a dynamic, flowing atmosphere, mostly unexplored elsewhere in his contributions to the album. With only four tracks on the promotional release of this soundtrack, Shunsuke Tsuchiya’s music and stylistic diversity is exhibited much better with the larger number of contributions featured here. The impression created from the promotional release was that Tsuchiya was mostly fond of militaristic percussion when it came to battle themes. Two examples were “Furiously” and “Decisive Battle.” “Furiously” is an interesting composition that features prominent use of choir and strings with some brass and piano accents thrown in there. “Decisive Battle” is also very choir focused and manages to throw in some nice accompaniments such as frenetic string sections and piano flourishes. Unsurprisingly, this remains largely true with his new contributions here, with “Darkness Spreading Underground” featuring an impressive, hard-hitting warring section, dominated by an eerie piano line and militaristic percussion. The best new militaristic theme is “Mission Chaser,” which remains grand, but also features a fantastic melody, amazing development, and satisfying variety in instrumentation. By no means does this sum up Tsuchiya’s contributions though, since he also dabbles in other styles. The airy and melodic “A Signpost in the Shades of Trees” and the eerie and discordant “Doubts” are probably the best examples of this. What is more noticeable, though, are his references to music from the Luminous Arc series and Yoko Shimomura’s famed style. “Waiting at the Farthest Ends,” for example, is reminiscent of Shimomura’s Kingdom Hearts series music with its haunting choir, string, and piano sections. Moreover, Tsuchiya also arranged her composition “Where the Heck is Kopin” from Luminous Arc 2. Now entitled “Kopin Race”, it’s a playful and quirky, yet ultimately disappointing theme with a focus on woodwind and string melodies with an underlying maraca accompaniment. By no means does it compare to his superb Luminous Arc medley “Witch Army ~Luminous Arc Medley~,” which explores many familiar themes in an enjoyable soundscape. It’s nice that these tracks are included, further adding continuity to the series’ music. Lastly, there is also Yuki Harada, who actually contributes the most to this soundtrack, despite only having two themes feature on the promotional album. The two themes we were presented with on the album were “Fulheim” and “Taking the Road Through the Wilderness.” “Fulheim” is a fantastic theme with a beautiful string and brass melody similar to Mitsuda’s work on Chrono Trigger. His other theme, “Taking the Road Through the Wilderness” is very mystical and the better of the two contributions. It manages to create a nice, mysterious atmosphere through the ethereal string and choir work and also harbours a beautiful melody. From these two tracks, which are mostly similar in sound, it was hard to conjure up an impression of the sort of music that Harada would contribute to the game, with this being his first venture into the game music industry. It turns out, actually, that Harada’s contributions are the most diverse, compelling, and entertaining tracks on the album. Harada continues his orchestral and airy styles with a couple of quaint tracks. Though he does slip up a little with the misguided “Sincerity” and “Carelessness,” the contributions in this area are mostly great. “Vast Lands” is a beautifully orchestrated piece with a strong melody, resonating development, and gorgeous string section. The piece is graced with a cutesy bass plucked ‘cello accompaniment, which adds a little bit of character. Another good example, “Everyday with Peace” starts with a simple piano motif before it is coupled with a pretty oboe melody and reverberant acoustic guitar part. The guitar is played delicately alongside these two instruments before a flute is introduced, further adding to the track’s ethnic and buoyant feel. Though much sadder, “A Decision in the Midst of Darkness,” “Memories,” and “People Looking Up to a Small Hope” are two other nice additions. “A Decision…” and “Memories” are two gorgeous piano themes, whereas “People Looking Up…” utilises a ‘cello to its advantage, further sustaining the piano backdrop. Alongside some militaristic and dark contributions in the form of “Pushing Forward,” “Signs of Dark Clouds,” and the emphatic “Fighting Spirit Baring the Fangs,” there are also a couple of unexpected additions from Harada. The pseudo-electronica style adopted by “Great Legacy” paired up with a charming choir, for instance, makes for a great quirky theme. Similarly, the industrial accompaniment to the flute-based “Galois Ravine” is a fantastic addition, and though the piece itself is simple, this touch alone adds so much character and really defines the track. The most surprising theme from Harada though, is “Unexpected Fight,” which stays true to its name. Starting off with distorted guitar sounds, the track ascends into an impressive (but simple!) melody played by strings. The accompaniment really compliments the melody, and interestingly, it seems to be done in a style unfamiliar to game music! The promotional album barely represented what this game truly holds in terms of its music, and really this full soundtrack is a blessing in that regard. Harada’s tracks are fantastic, Mitsuda’s tracks are pretty good, and Tsuchuya’s militarism adds a refreshing touch to the album. Though this release was extremely late, it’s certainly an album which shouldn’t be missed. By no means is it the best album in the Luminous Arc series, but it certainly features some of the best production values of the Wii and works wonderfully in its traditional in-game context. It also contains some fantastic tracks, mostly from Harada, who will hopefully bloom in the game music industry in the near future.